Have you ever wondered where your garbage goes when it gets picked up from the curb? It might return to your home through the powerlines. Minnesotans burn wood chips, livestock waste, garbage, landfill gas, and more for electricity and heat. This diverse industry impacts every corner of the state in some shape or form—and controversy often follows. According to a federal Department of Energy (DOE) report, these plants directly employ at least 650 Minnesotans in fuel production across the state. The electric power generation portion of the DOE report also notes 2,186 jobs in the “Other Generation” category, of which a significant number come from biomass plants. These plants also impact the livelihood of those in adjacent sectors, like livestock production, waste hauling, and recycling—worth thousands of jobs and billions of dollars to the state’s economy. The map above shows various biomass plants across the state with an overlay of biomass resources. The darkest shade of green represents at least 500,000 tonnes (metric tons) annually, and the lightest shade 50,000 to 100,000 tonnes. That’s a lot of biomass. 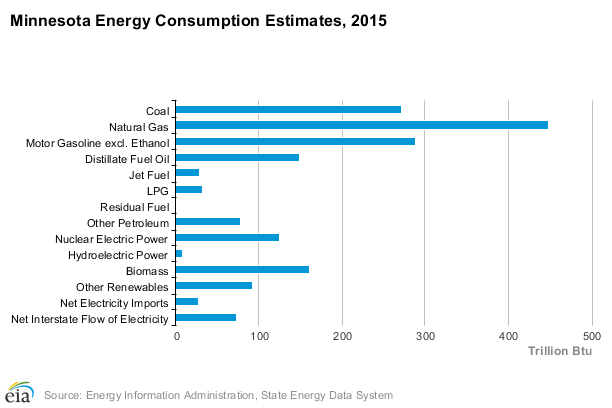 In fact, biomass in Minnesota represented the fourth-largest resource by consumption in 2015 (the most recent year available)—more than nuclear power, and more than solar and wind combined. The chart above represents heat-equivalent units (Btu), which is appropriate for the biomass industry as many plants provide both electric power and heat, either for an adjacent industrial process or as district heat for nearby homes and businesses. One such plant, the Hennepin Energy Recovery Center (HERC), is one of eight waste-to-energy plants across the state, which together produce enough electricity to power 100,000 homes. These facilities divert municipal solid waste (MSW) from landfills, and, like all biomass plants, are considered renewable energy by the federal Environmental Protection Agency (EPA). Proponents of waste-to-energy note that diversion of waste from landfills avoids methane leakage. Methane is 25 times worse a greenhouse gas, pound-for-pound, than carbon dioxide over the course of a century, and landfills emit 16.4% of anthropogenic methane in the United States. MSW biomass plants may be better economic options than landfills too: according to Hennepin County, the HERC employs almost three times as many people (45) in higher-wage positions than a landfill. HERC meets all applicable federal and state air quality standards. However, critics point to elevated levels of heavy metals in nearby North Minneapolis as an environmental justice issue, which disproportionately impacts the health of low-income households and people of color, and contend that HERC contributes to the problem. The HERC currently consumes 75% of Minneapolis garbage. Statewide, 68% of MSW was diverted from landfills in some way in 2016, the most recent year available. Some communities in Greater Minnesota will soon lose an option to convert waste to electricity altogether. Last fall, Xcel Energy petitioned the Minnesota Public Utilities Commission (MN-PUC) to purchase and then close Benson Power, a power plant that uses a mix of turkey litter and wood chips to produce up to 50 MW of electricity, enough to power a thousand homes. In January the PUC approved a plan to close the plant this summer. That plan will save Xcel ratepayers $345 million over the next 11 years, because the wholesale costs of the Benson plant’s electricity exceed what the utility can procure from other sources. The city of Benson supports the closure, even though it will lead to a loss of 45 full time jobs and 100 supporting jobs. The state Department of Employment and Economic Development once projected an annual $8-10 million impact on the community. The plant paid $930,000 in 2017 property taxes, for about a quarter of the city’s revenue. As part of the plan to close the plant, the city will receive $20 million from Xcel Energy to transition out of the economic loss from the plant’s departure, beginning next month. The economics on the fuel production side of the equation for the plant are changing too. The Kandiyohi County landfill accepted trees and brush until very recently, but with the facility on its way out, the cost to grind woody biomass for the landfill became uneconomical for the county. LIke the turkey farmers that have lost a $28 million dollar revenue source for turkey litter in Benson, Minnesota, loggers will miss both the Benson plant and a wood-chip fired facility in Virginia, Minnesota. Both plants—but not other biomass plants elsewhere in the state—were affected by a 2017 repeal of a 1994 biomass mandate. Wood-chip suppliers for the Virginia plant, which include at least 20 companies, will lose $7 million in revenue—and imperil many or all of the associated 100 direct jobs. Whether wood chips, manure, or household garbage, biomass represents a bigger slice of Minnesota’s energy landscape than you might have imagined—wherever you live in the state. As policy priorities and economics shift, biomass management and its economic impacts will affect the day-to-day life for all Minnesotans.